Electric Scooter: My Two-Wheeled Hero! ...and you're on your way to the office, 5 miles from home. What do you do? Do you fire up the gas-gulper and add another ton of carbon to the atmosphere? A two-wheeled electric vehicle is a GREAT way to gently wean yourself off the gas pump without spending a lot of money up front. For kids, electric scooters and electric bikes are often the "gateway drug" that gets them hooked on electric transportation. 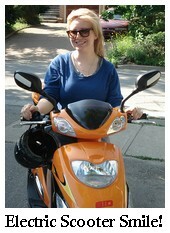 I'll talk a little about scooter laws and how to be an upstanding two-wheeled EV citizen. The ones that are street-legal (drive them on the street like a motorcycle). ...in which case, think of yourself as a bicycle and act accordingly. Most of the time you can ride your scoot on bike paths; the only exception is when there are signs which specifically prohibit motorized vehicles. The police probably won't know the laws on scooters in your town. You can do a lot to avoid confrontation with a judge by being polite and courteous (not mowing down 80-year-old pedestrians, for example), wearing appropriate safety equipment like a helmet, and not endangering yourself or others. In other words, act like an adult and they'll let you be. Street-legal scooters, of course, are just that - street legal. They're licensed by the DMV (and so cost more), have the usual safety equipment, and go faster. 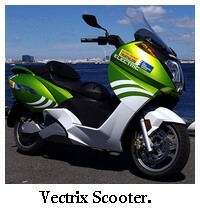 Interested in electric motorcycles? Read my interview with Electric Cowboy and his Zero, Foxie Cleopatra. Next, check out my interview with Falcon EV, a friend of Electric Cars are for Girls who sells quality electric bikes and scooters in Florida.